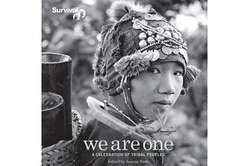 The cover of &apos;We Are One&apos;, the photo book marking Survival&apos;s 40 birthday. Unique collection of indigenous wisdom, stunning photos and writing from international authors, poets, journalists and others. All photographs, articles and extracts have been donated in recognition of Survival International's 40th Anniversary. All royalties go to Survival. The new book We Are One is a unique collection of statements from the world's tribal peoples, from the Yanomami of Brazil to the Penan of Malaysia and the Innu of Canada, which is supported by powerful essays and photographs from international authors, campaigners, politicians, philosophers, poets, artists, journalists, academics, anthropologists, environmentalists and photojournalists. 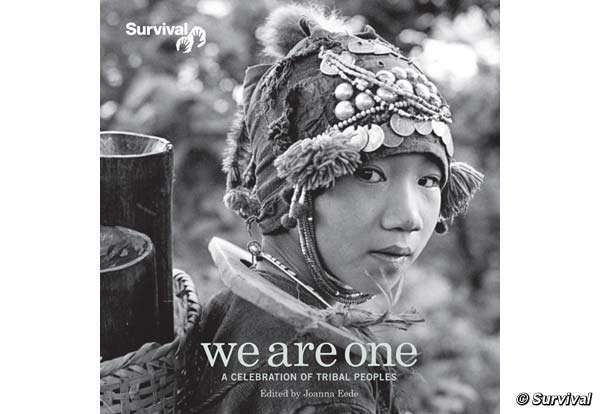 In a unique display of solidarity that celebrates the 40th Anniversary of Survival International, We Are One’s collective voice celebrates the lives, homelands and values of tribal peoples and explores the relevance of their beliefs and wisdom to the present time. It also highlights the oppression tribespeople are experiencing today, promoting the message that tribal peoples are equal to us: just as modern, just as much part of the 21st century and with just as much right to live in peace. We are One is both a portrait of the beauty and diversity of tribal peoples, and a call to arms that raises many of the contemporary humanitarian and environmental issues inherent in their fight for survival: the growing universal need to place human values over economic ones; climate change and the destruction of rainforests; why western notions of 'progress' and 'development' should be redefined and why the tribal values of balance, humility and reciprocity are more important than ever in today's world. Davi Kopenawa Yanomami, known as the 'Dalai Lama of the Amazon Rainforest' on consumerism, climate change and the health of the Amazon. We are One includes previously unpublished contributions from Richard Gere, Zac Goldsmith, Colin Firth, Bruce Parry, Jane Goodall, Joanna Lumley, Damien Hirst, Satish Kumar, Tony Juniper, Jonathan Porritt, Vandana Shiva, Sydney Possuelo, Carlo Petrini, Wade Davis, Arundhati Roy, A.C. Grayling, Robin Hanbury-Tenison and many others. The foreword is written by Davi Kopenawa Yanomami, and the introduction by Stephen Corry, director of Survival. Literary extracts include: Laurens van der Post, Peter Matthiessen, Colin Thubron. Contributing photojournalists include: Sebastião Salgado, Kate Eshelby, Mike Goldwater, Steve McCurry, Mirella Ricciardi, Carol Beckwith.